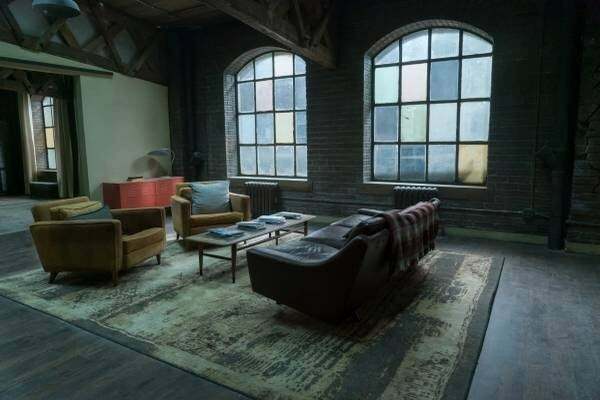 Whether you like Marvel's Daredevil series on Netflix or not, there's one thing about the comic-inspired show that we can all agree on: Matt Murdock's apartment is pretty awesome. However, that glorious Hell's Kitchen apartment has been vacated, since Daredevil was thought to be dead after The Defenders, and now it's up for rent. "Spacious loft apartment located in heart of Hell's Kitchen, left virtually unscathed by recent tremors. Hardwood floors and exposed brick from floor to ceiling. Marvel at the reclaimed industrial windows that provide a must-see view of Hell's Kitchen. At night, brilliant neon lights across the street bathe the apartment in a soothing, warm ambiance. "Previous tenant left without notice, so apartment comes fully furnished! Kitchen features a modern wooden bar and floating kitchen shelves for additional storage. Apartment is outfitted with sliding doors and an open floor plan, great for anyone with accessibility needs. Within walking distance of a boxing gym, courthouse and local law offices. "With an apartment this nice, you'll feel like you're living a double life. Don't miss out, this apartment will be available October 19." The craziest thing about this (totally fictional) listing is that the price could never be beaten. A converted warehouse loft in Hell's Kitchen for only $2,000 a month? That's an incredible price, to say the least. Of course, there are no numbers to call to respond to this listing, and the date of availability for the place is on October 19th, the day that Daredevil Season Three premieres on Netflix. While this could be any Marvel fan attempting to being a smile to the faces of their peers, it's likely an expert course in viral marketing from the savvy folks at Netflix. Have you seen their Twitter account lately? This is totally up their alley. Season Three of Daredevil arrives on Netflix on October 19th. The first two seasons of the series are currently streaming.